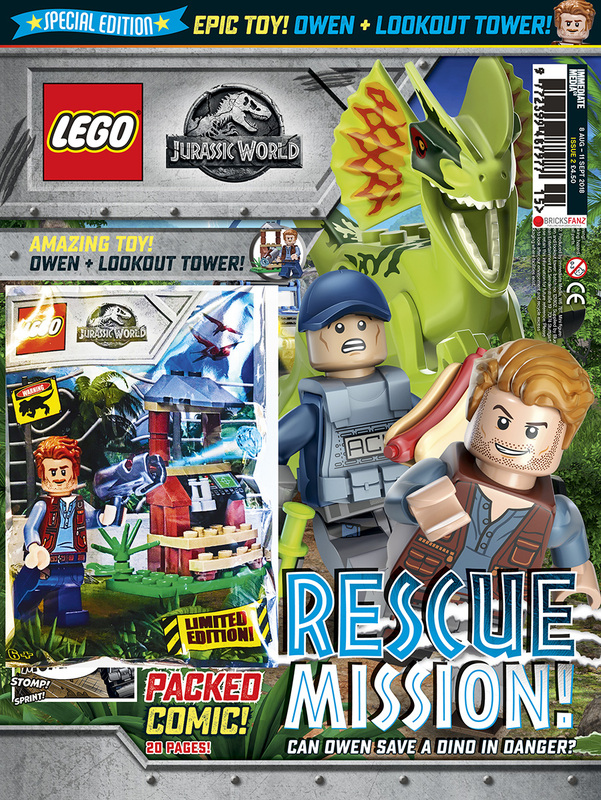 The roarsome second issue of the LEGO® Jurassic World magazine arrives in stores today. Issue two includes an exclusive Limited Edition Owen minifigures and Lookout Tower minibuild. As well as the free LEGO, inside the magazine you’ll find two cool LEGO Jurassic World posters and door hangers. Comics, quizzes and more. You’ll find issue 2 of the LEGO Jurassic World magazine in WHSmith, Sainsbury’s, Asda, TESCO, and independent newsagents. You can also order online, with worldwide delivery from newsstand.co.uk. It’s on sale until September 11th. Hi i bought the second issue with my son today and 5 main pieces are missing. I have a photo i can send of the pieces we have. How can i go about recieving the peices that are missing. There’s two options you either return it to the retailer who you purchased it from for a refund or exchange. Alternatively if you look in the magazine (normally on the back page) there will be a contact email address and phone number. If you contact Immediate Media via one of those, they will sent you a replacement set. Owen and the lookout tower is an amazing gift with the comic, well worth getting! Hi, we bought this magazine for our son today and it has 5 pieces missing from it so it can’t be built! You can either return it to the retailer you purchased it from or if you look in the magazine, normally the back cover, you’ll find an email address and phone number. Contact Immediate Media via one of those and they will sort it for you. The publisher hasn’t confirmed any future issues, but the next LEGO Special is focused on LEGO City! Hi we bought the second jurassic world comic in August but haven’t seen any since, when is the next one out, my grandson lives it. Its part of a series called LEGO Specials so switches it’s theme with every issue. Current issue is LEGO City. As far as I’m aware there are currently no plans for further issues based in the LEGO Jurassic World play theme. Hi, I have tried to find issue 2 but I can’t find it anywhere in my local area. I have also traveled a far and still can’t find it.